Version 4.3 of CARROT Weather for iOS launched today, bringing a ground-up redesign of its Apple Watch app that offers power and flexibility in a beautifully designed package. CARROT Weather's story isn't that it had an old, out-dated Apple Watch app that's now finally become modern. Instead, today's update takes what was already a very good Watch app and replaces it with a great one. Before this big redesign, CARROT's Watch app was already fast and flexible, with an assortment of customization options for things like complications. It even worked well when your Watch was running solo; by contrast, most third-party Watch apps depend entirely on a paired iPhone and can't function at all when untethered from the device. CARROT's new Watch app keeps all these positives, improves upon them, and adds a lot more to the package. Left images: CARROT's redesigned Watch app; Right images: CARROT's previous Watch app. The redesign starts with a set of beautiful visuals. While the prior version of the Watch app wasn't bad looking in any way, it also didn't have much personality to it – and personality is a defining attribute of CARROT apps. Now, CARROT Weather on the Apple Watch truly looks like a little brother to its iOS counterpart, with colorful icons, bolder fonts for important interface elements, and familiar design mechanics. The main interface of the Watch app can be customized in several useful ways. Temperature can be set to Actual or Feels Like, extended forecasts can show 3, 5, or 7 days (the lower the number, the quicker the app loads), and the displayed summary can list a snarky line, or relevant data regarding weather for the next hour, day, or week. Most importantly, though, you can select from up to fourteen different data types to fill four available data slots on-screen. If you don't need that much information, you can leave some or all of these blank to have a less cluttered screen, but the point is that the power's in your hands. 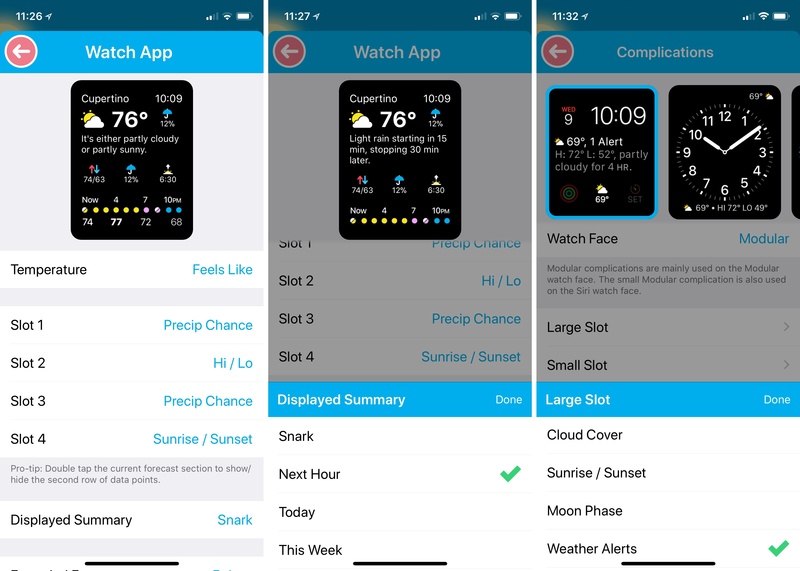 Customization options for CARROT Weather's Watch app and complications. Customizing CARROT's Watch app feels just like customizing a watch face with complications. The top of the screen shows you a live preview of the interface as you make changes, and the finished product very much resembles what a custom, third-party CARROT watch face would surely look like. Also, like a proper watch face with complications, you can tap on the different data points in the app to open new screens with more information. Besides the great new look and powerful customization options, CARROT's Watch app features several other improvements. CARROT can talk. That voice you know and fear on iOS has made its way to the Watch app. If your Watch's sounds are turned on, you can get spoken forecasts and commentary from CARROT's AI – even on older Apple Watch models. Richer notifications. Weather notifications now contain a lot more detail than before, and are a fantastic demonstration of the power of rich notifications. Full weather alerts. If there are active weather alerts in your area, you can now read the full text of those alerts in CARROT's Watch app. Radar. Exclusive to members of the Ultrapremium club, using Force Touch on the app reveals the option to view a radar feed right on your wrist. When the Apple Watch first launched, it was presented as a sort of mini-iPhone for the wrist. Apple executives talked up its ability to run a myriad of different apps, just like the iPhone. But the device didn't really live up to that promise – it was fine for fitness tracking and notifications, but slow hardware and convoluted software made regular use of Apple Watch apps a frustrating experience. Lots has improved about the Apple Watch since its launch, with the recent Series 3 and watchOS 4 delivering a product that's finally powerful enough to live up to its initial promise. While the Watch will likely never be a device for extended app use, it can now serve as a capable alternative to the iPhone when you need a quick piece of information. The hardware's better, the software's better, and the SDKs available to developers are more powerful. But in order to fully take advantage of these improvements, apps have some catching up to do. Many Watch apps haven't been touched by developers since watchOS 1 or 2. But the potential's there now to make a truly great Watch app – and CARROT Weather is a great demonstration of that. CARROT Weather 4.3 is available on the App Store.